Mike and I spent this last week in Monrovia, Liberia with Global Strategies where we got to meet some of the students and graduates at Mother Patern College of Health Sciences. The students at the school are studying to become nurses, social workers, or laboratory technicians. Liberia has lost many of its medical professionals due to years of civil war. 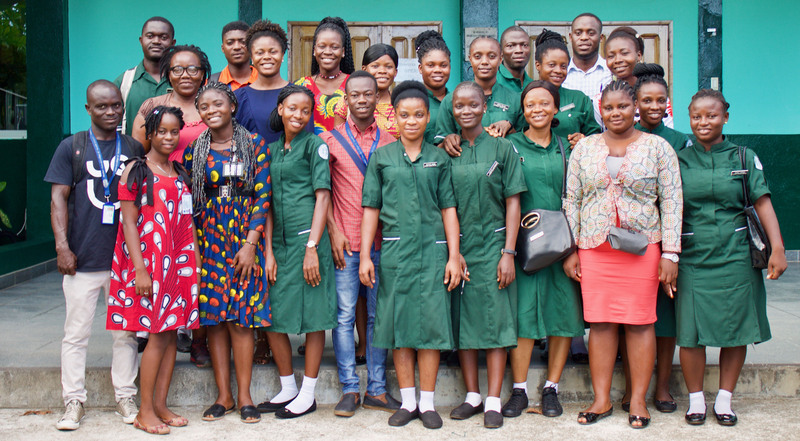 These dedicated students and graduates of Mother Patern are committed to helping rebuild the healthcare workforce of Liberia. Global Strategies is proud to to be a part of their journey in supporting their education through the scholarship program. This scholarship program has existed since 2014 and has already sponsored 38 students. Currently it supports 19 students. We had the opportunity to sit down and meet with all the recipients of the scholarships and some of the graduates to understand what being a recipient of the scholarship meant to them and how it has impacted their lives. In talking with these students, we found that many students faced difficult circumstances in their personal lives and this scholarship gave them hope. Hope for a career in health care, hope to help rebuild their country, and hope for a better future. Without the scholarship, many of the students would not have been able to pursue a higher level of education. The scholarship gave the students and graduates the ability to focus on their studies and not on financial constraints and for that, they were extremely grateful. When asked about why the students chose a career in health care, many chose a profession in health care because they wanted to help rebuild their country after many years of conflict. Others chose professions in health care because of a passion to help others. And lastly, many students had a first hand experience in caring for a family member in the hospital and desired a career in health care after seeing how compassionate hospital staff were to their family members. In meeting the recipients of the scholarships, we found them to be extremely ambitious and desired to continue their education and seek higher level degrees. Many of the nurses were working full time and going to night school to get their bachelors degrees. Others were planning on trying to continue their education after they graduated from their associate degree and wanting to get their bachelors and continue with their masters. The level of commitment of the students is inspiring. Despite various hardships the students maintain hope and a strong pledge towards a better future for themselves, their community and their country. It is truly humbling. The impact that one person can provide through scholarships and education cannot be underestimated. Being born in the western world we are afforded opportunities that others may not have. What might be a relatively small quantity of money or time for us can go a long way to impacting and providing someone else an opportunity for a better future. With Global Strategies, we are helping children in Goma who are malnourished. They come to the hospital and we help them recuperate. We have helped thousands of children recover their health.